Nature at your fingertips! Don your walking boots and explore the area. You can book guided walking from your local representative and really explore the depths that this beautiful island has to offer. Relaxing on one of the sunbeds on the rooftop terrace whilst indulging in your latest read, with a scenic backdrop to die for! There are some very good local restaurants in Ponto do Sol. 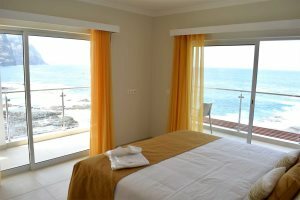 O Valeiro is less than 100m from the hotel, serving good value local dishes, using the freshest fish from the day’s catch. Service can be slow. Wherever you eat, make sure you adopt the ‘no stress’ Cabo Verde attitude. 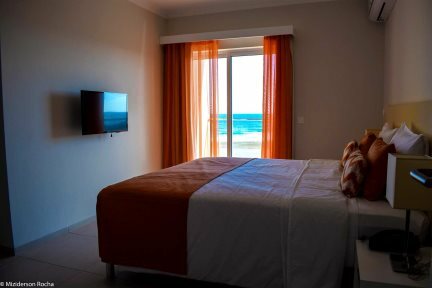 Located on the northernmost tip of the island in Ponto do Sol, a typical Cape Verdean fishing village, Tiduca Hotel is ideally placed for guests to experience local Cape Verdean life. It’s a lovely pastime to watch the fishermen head in and out in their colourful boats and return at the end of the day with their catch. Backed by the island’s renowned green mountains, walking is a popular pursuit, and heading off to explore the capital, Ribeira Grande, is a rewarding activity for those looking to discover the destination beyond the golden beaches. The hotel itself opened in late 2017, and boasts a light, modern décor throughout. 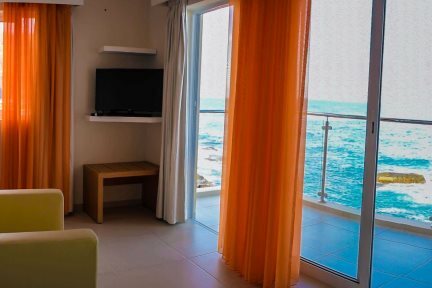 Its position right in front of Boca de Pistola harbour means that holidaymakers can make the most of the incredible surrounding ocean and mountain views from either your private balcony, or the hotel’s spacious rooftop terrace. 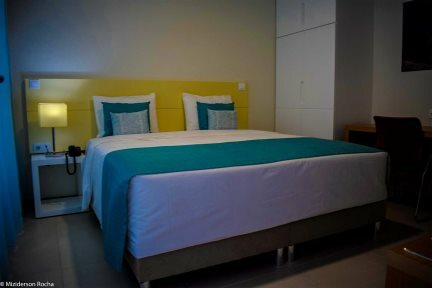 The guest rooms are decorated in the same modern theme, using white tones and splashes of bright colour to give them a comfortable and welcoming feel. 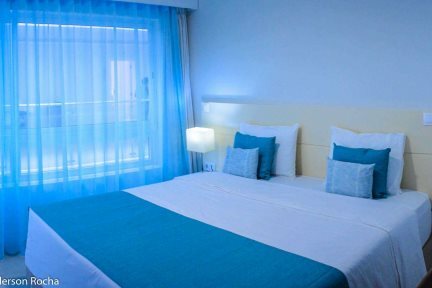 On the fourth floor of the hotel, you’ll also find a small spa, where you can unwind with a massage or treatment after a busy day exploring the island. 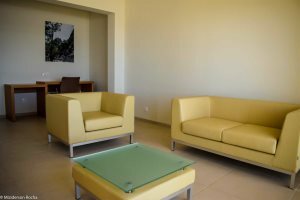 If this wasn’t enough, there’s the comfortable Esplanada bar, where you can sit back and relax with your favourite beverage! 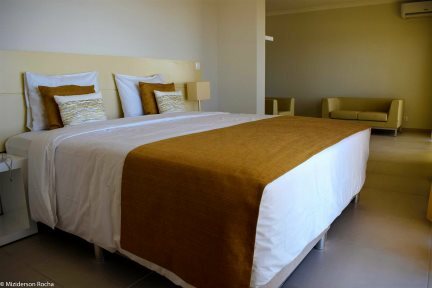 Just a short walk from Tiduca Hotel will bring you to the small yet charming town of Ponto do Sol. Here you’ll find a handful of restaurants and shops, along with a cobbled square, decorated with palm trees, along with a church and a pretty, bright yellow Portuguese building. 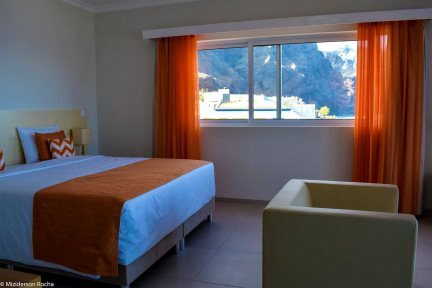 The views from the town are stunning, as (similar to that of the hotel) you’ve got the ocean to one side and the imposing lush green mountains on the other, promising the prospect of adventure. 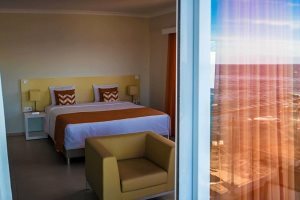 Tiduca Hotel is the ideal choice for those looking to immerse themselves in Cape Verde’s ‘no stress’ culture and discover the true beauty of the archipelago beyond the beach. 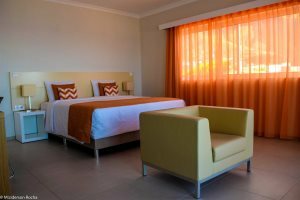 We recommend Tiduca Hotel for a two or three-night add-on stay to your Cape Verde holiday. Travelling time between Sal and São Vicente is approximately 45 minutes' flying time. Followed by a 1 hour ferry journey from Mindelo (São Vicente) to Porto Novo (Santo Antão). 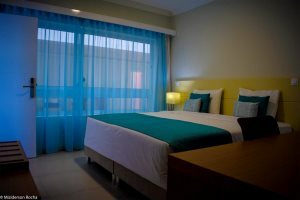 Double or twin beds without a balcony. These rooms have windows that face into the hotel hallway, where there is natural light coming from the ceiling skylight. These rooms have no view of the outside. 17m². 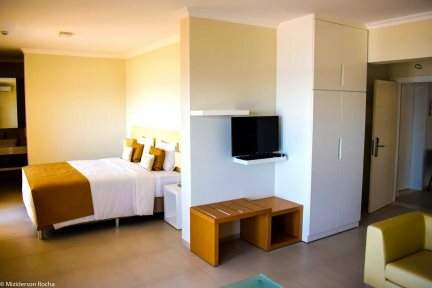 Air conditioning, TV with access to 17 channels, Telephone, Wi-Fi, Safe box, Hairdryer. 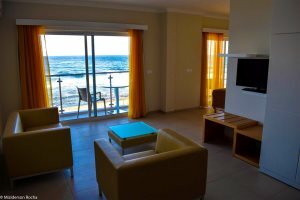 Double or twin beds with balcony with sea and / or mountain views. Elegantly decorated with pictures and objects that tell the history of Ponto do Sol or the island of Santo Antão. Comfortable and spacious rooms 30m² with Double or twin beds and a living room with sofa and armchairs as well as a furnished balcony with views of the sea and mountains. Comfortable and spacious rooms 46m² with double or twin beds and a living room with sofa and armchairs as well as a furnished balcony with views of the mountains & sea. Air conditioning, TV with access to 17 channels, Telephone, Wi-Fi, Safe box, Hair dryer.